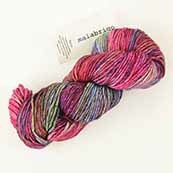 By popular demand (by both staff and customers) we have added Mecha to our knitting yarns. This amazing superwash single-ply yarn has the Malabrigo softness you find in their other yarns, and of course the rich, vivid, and beautiful colors. Mecha is a bulky weight yarn great for accessories, garments, baby and kid items. It has sharp stitch definition and knits up quick! It can be machine washed in cold, on a gentle cycle, and dries flat.